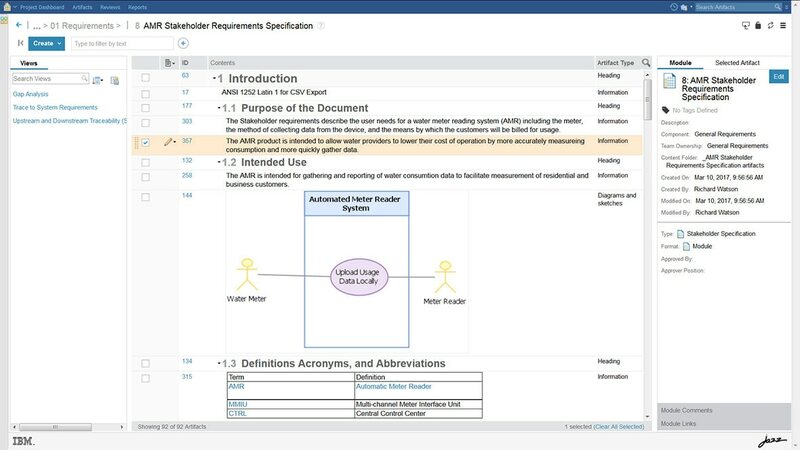 IBM Engineering Requirements Management DOORS Next offers tools for capturing, tracing and analyzing requirements for complex products and systems as part of the IBM Watson® Internet of Things (IoT) portfolio. It allows you to take control of your project costs with change and configuration management built directly into the requirements tool. This software is available on premises and in the cloud. Requirements Management DOORS Next 9 users who want a single-server or purely web-based requirements solution can create a stronger collaboration among multi-disciplinary product development teams. Access a single server solution across disciplines, time zones and teams. Integrate with Workflow Management, Test Management and Systems Design Rhapsody Design Manager on IBM Jazz™ engineering lifecycle management platform. Migrate easily from DOORS Next using a built-in migration tool. Have the IBM Engineering Requirements Quality Assistant evaluate and provide recommendations using ten parameters from the INCOSE standard to evaluate, score and provide recommendations to improve requirements saving time while optimizing resources. Discover the software requirements for IBM Engineering Requirements Management DOORS Next with IBM Software Product Compatibility Reports. Discover the hardware requirements for IBM Engineering Requirements Management DOORS Next with IBM Software Product Compatibility Reports.